Optimized for 100 mm of travel, the Step-Cast lower leg design and narrow crown spacing save weight while the 32 mm upper tubes maintain FOX ride quality. Inspired by Geoff Kabush through our RAD program, the Kabolt is now available for all 15QR forks. The distinct shape of the lower leg design isn't just for looks. The 32 Step-Cast (SC) chassis uses a narrow stance to save weight and the step design makes room for the spokes and brake rotor. The 32 SC features 32 mm upper tubes and ample bushing overlap for a quality ride and the hollowed out lower legs provide even more weight savings. 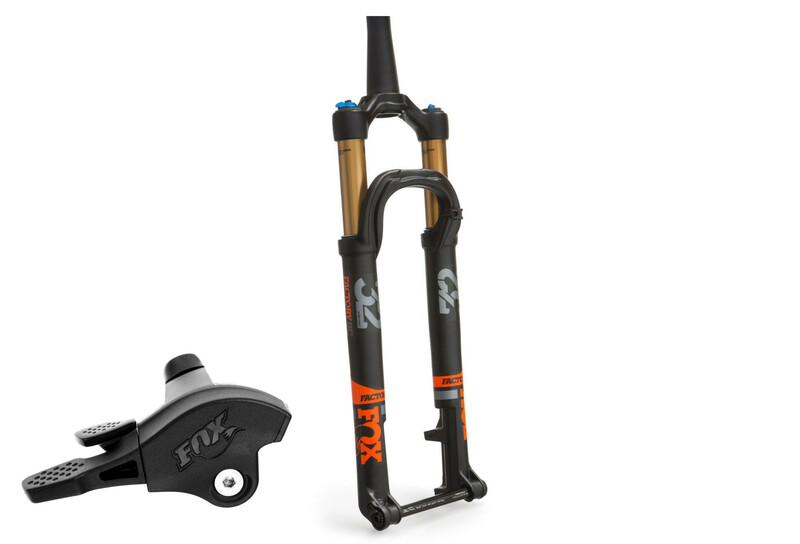 Now in its fourth generation, our patented FIT4 (FOX Isolated Technology) closed cartridge system provides three on-the-fly compression damping positions Open, Medium, and Firm to adapt to varying trail conditions. Factory Series forks feature an additional 22 clicks of low-speed compression adjust in the Open mode, allowing riders to fine-tune their exact damping preferences. The FIT4 cartridge damper was redesigned based on our award-winning HSC/LSC damper, resulting in a much higher performing damper across all forks. This year, the FIT4 damper received an updated tune that provides more sensitivity while maintaining support. The FLOAT air spring system developed for 32, 34 and 40 is lighter and reduces the force to initiate travel, providing excellent sensitivity and small bump compliance for all riders and pressure settings. Similar to our FLOAT rear shocks, the new FLOAT system features positive and negative air springs that automatically equalize during use to give each rider the right pressure balance. The progressiveness of the spring curve can be adjusted via air volume spacers, allowing riders to fine-tune the feel of the air spring.